Collections of cards of Yorkshire were the best sellers in the topo section of the Warwick and Warwick sale, held in Warwick, on 16 May. 5 boxed accumulations were on offer, estimated in total at £1120. The total realisation was £2190. 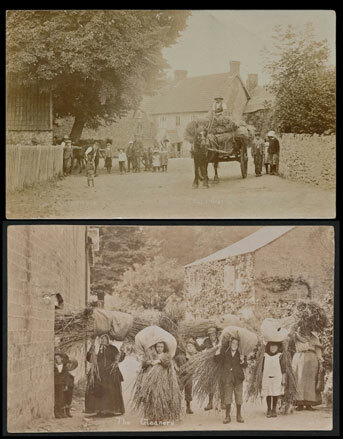 A rural life collection had been broken down and amongst the cards offered singly, an RP of a Chardstock (Devon) blacksmith shoeing a horse made £41 and an RP of village women and children carrying sacks of reeds for thatching, published by a Blockley (Gloucestershire) publisher, reaslised £48. The sale was rich in artist-drawn cards, where several single artist collections were on offer. 50 cards by Raphael Kirchner, in average condition, realised £840 and 50 by Xavier Sager, in good condition, made £324. 139 HGC Marsh Lambert children with a few animals, generally fine, achieved £114 and 400 AR Quintons, unduplicated, made £204. Condition was a major factor in the Louis Wain section, which under-performed. Faulkner’s 593 Series set of 6, all in good condition, apart from one with trivial surface blemish, estimated £150, realised £108. Military was a strong section. 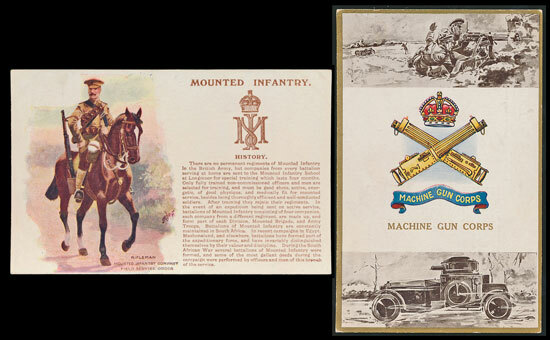 A collection of 196 Gale and Polden History & Traditions and Battle Honours cards, nearly all in good condition, made £840 (£4.29 each) and a 125 strong collection of their Regimental Badges made £588 (£4.70 each). 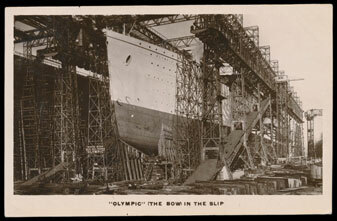 In the shipping section, a selection of 20 White Star Line cards included an RP of the construction of the “Olympic”, at Harland & Wolff’s Belfast shipyard, with the “Titanic” partially constructed alongside. The estimate was £240 and the realisation £420.